Heart disease is the leading cause of death in the USA and other developed countries. Imagine the number of lives that could be saved if doctors could predict heart attacks before they happen. Most heart attacks are caused by a buildup of cholesterol and triglycerides (called plaques) inside heart arteries that rupture, form blood clots, and block the artery. But not all plaques rupture and not all plaque ruptures cause disease. An Australian team of medical doctors and mechanical engineers hopes to predict where plaques will form, which plaque sites will rupture, and which ruptured sites will cause heart attacks. With this knowledge cardiologists could place a stent to hold open the afflicted artery before the attack occurs. As a river twists and branches, sediment builds up on some banks, and the water sweeps others bare. The same is true of arteries and plaque formation. And each individual has different arterial branches. Knowing an individual’s heart artery structure will enable the design of individualized 3D-printed models to help plan surgery, and design perfectly fitted stents, which would aid in the current challenges of stent placement. 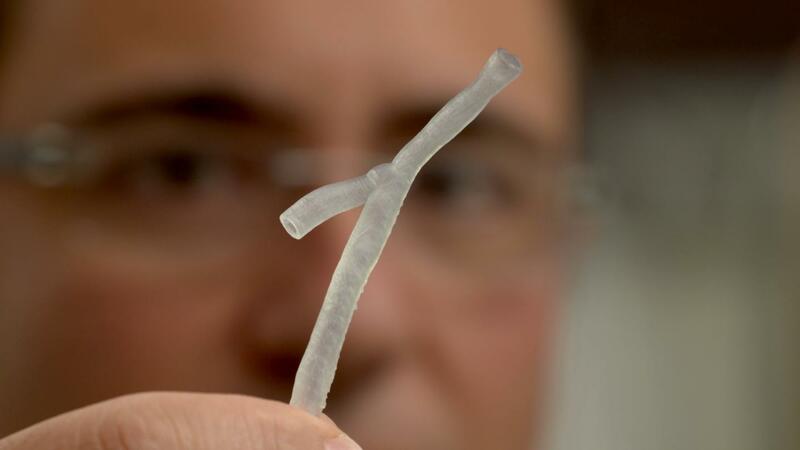 Peter Barlis, the leader of the team, holds up a 3D printed artery in the leading image above. Dr. Peter Barlis at the University of Melbourne and a team of researchers are working on predicting the sites of future heart attacks, by using state-of-the-art imaging techniques and computer models. The imaging technique, called optical coherence tomography (OCT), is a type of CT scan, except instead of x-rays it uses near-infra red light, at the edge of the visual spectrum. In the video below, you can see a red light on the camera. The light does not penetrate as deeply as x-rays do, so a wire-like camera is inserted into the heart via a vein. It can be performed at the same time as a routine angiogram. Barlis brought OCT imaging to Australia in 2009, and now it’s used in all major hospitals there. It was approved by the FDA for use in cardiology in the US in 2010. But researchers can’t know if they actually prevented an attack or if it would not have happened in the first place. They are attempting to connect arterial branch location, the types of mechanical stress on arterial walls, blood flow, and existing plaque to the risk of rupture. Barlis and a team of researchers published a review article in the European Heart Journal in February of this year about current computer modelling techniques to give other cardiologists insights into this growing field.